The most interesting thing for many a youth is finding that coveted summer album they can play for the months ahead and be the cool kid, who knows what’s up. Thankfully I can count myself among that crowd this summer. I may be giving away the results of this week’s album review a tad early, but dammit if I care. I am so happy to have this album review under my belt, so I can just get ahead with enjoying this record. Weezer is an American alternative rock band with emo, power pop, pop punk, and alt rock influences. They are originally from Los Angeles and consist of Rivers Cuomo (lead vocals, lead guitar), Patrick Wilson (drums), Brian Bell (rhythm guitar, backing vocals, keyboards), and Scott Shriner (bass, backing vocals, keyboards). This is their fourth self-titled album, affectionately known as the white album, and is preceded by the red album (2008), then the green album (2001), and the blue album (1994). But in fact, this is their tenth studio album, so don’t be confused by the naming, IF you are a new fan to the band. Weezer have an interesting history, as is often the case with well-established musical acts. I myself was introduced to them from a fairly very young age, around the time that I was early in my high school year and when the green album was making the rounds. This was also in an age before the internet and self-promotion was the norm. Artists still used the radio and MTV to get attention for airplay. Then kids would hit the record store for vinyl and/or CDs and fall in love proper with the band of the day. However, in Canada we had something called Much Music instead and so I was listening to the Much Music Big Shiny Tunes compilation albums to learn about cool new music. My friends helped too, but to be honest, I liked to explore when it came to music AND I was also happy to follow the advice of mentors along the way, so I deviated from the rap game a bit and explored the rock genre too. At this time, Big Shiny Tunes 6 was THE hot new thing, and Hash Pipe was featured on the track list. And boy was that ever a good song… Seriously though. Which leads me back to this album. You see, a lot of people will agree that the blue album, and the green album were brilliant albums, definitely the career moments for Weezer, and they are finally starting to accept Pinkerton as genius too. Pinkerton came between those two albums. Then they released a couple more albums, and finally the red album, which wasn’t as good, but had me convinced it would be because of the self-titled nature of it. Then they released four more albums between 2008-2014 and people started to pay attention again. Everything Will Be Alright In The End was a return to form and got people excited about the band again. But is the white album any good? Well in short, yes. And the reason is that Weezer made an album where every single song is just as good as the previous one. In exactly the same way that the blue album and the green album were constructed. You see, as I mentioned already, we are now in the era of self-promotion and a level playing field (for the most part), when it comes to airplay and exposure. When Weezer was phoning it in and releasing albums with 2 or 3 good singles and a lot of fill, other bands were playing local venues, sharing their music online, and interacting with their fan base through emerging social media. The white album is a redemption album. 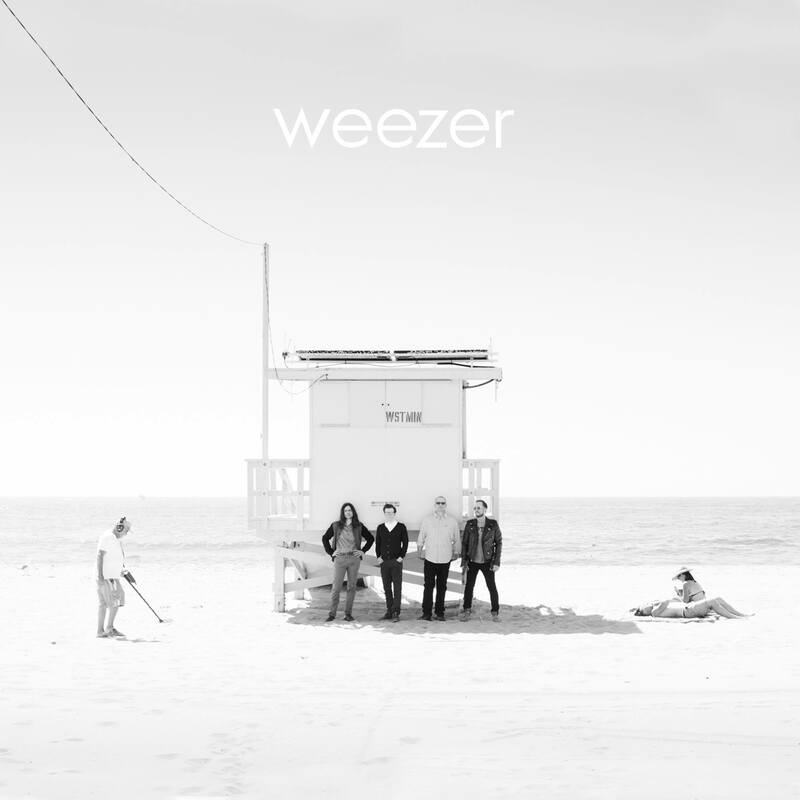 And like the blue album, which was an opportunity for a Californian act to make a name for themselves, or like the green album, a place for a band to reform and reinvigorate after a break from the scene (and a supposed failure in Pinkerton), the white album is about Weezer caring through the entire effort to produce something of merit. I can’t tell you which song is my favourite, because like any good album, I cannot single out one track on this record for you to listen to. You need to hear it all. It’s inspired by California and definitely has a surfer vibe, which is what Weezer is good at. So check out these music videos (1 2 3 4 5) and pick up this album. As a long time Weezer fan, and a music fan in general, I’m telling you that it’s worth it! I will say this about one track of the album in particular. Endless Bummer is a fitting ending song for the white album. Because you’ll know the album is closing out, and that’s kinda sad. But no so sad that you can’t just put the album on repeat and start it all over again. As I said above, I was so happy when I put this album on, because it meet my expectations of an album, and it was a personal triumph because I’ve been hoping for this Weezer album for years now. It probably deserves that 9, and in my heart I want to give it a 10 because I’m just that happy with it, but I’ll keep it at a 9 for you fine folks. That’s how serious timotheories is about it’s theories on the arts. Until tomorrow, when we review another return to form, via the movie route, I’m out of theories for now friends.